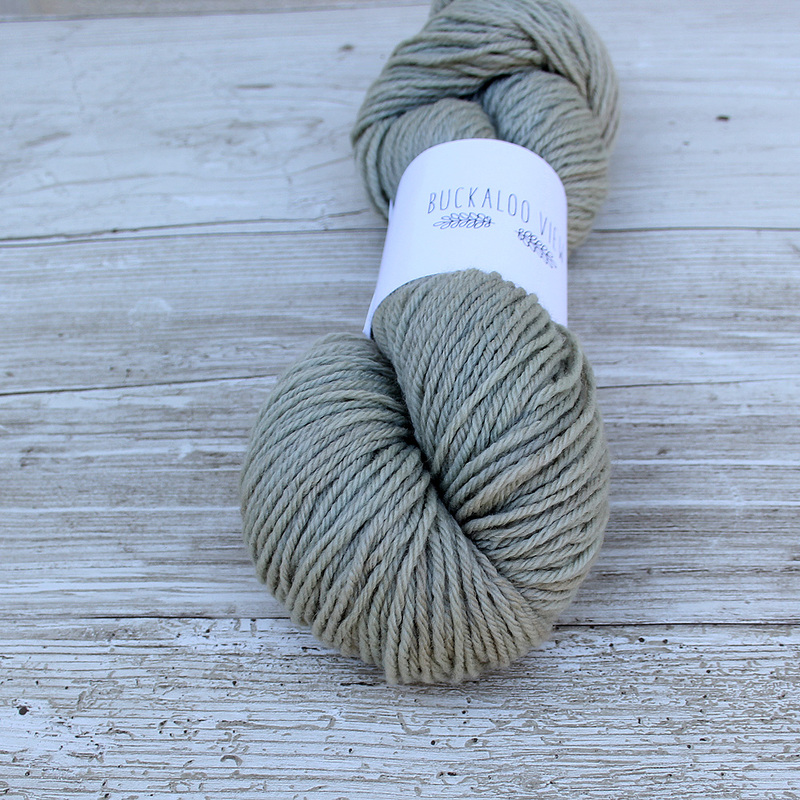 Buckaloo View yarns are all dyed by hand in small batches directly from locally grown or foraged plants as well as various kitchen and garden scraps. My process starts with prepping the yarn by scouring and mordanting it. Both of these processes help the color fix to the fiber. What I use is generally considered safe (things like alum and cream of tartar and occasionally I use certain modifiers like vinegar or baking soda.) The next step is to gather materials then extract as much color as possible from them. This is usually done by boiling or simmering the material in a pot of water. Next the yarn is added to the rich, colorful strained dye bath. 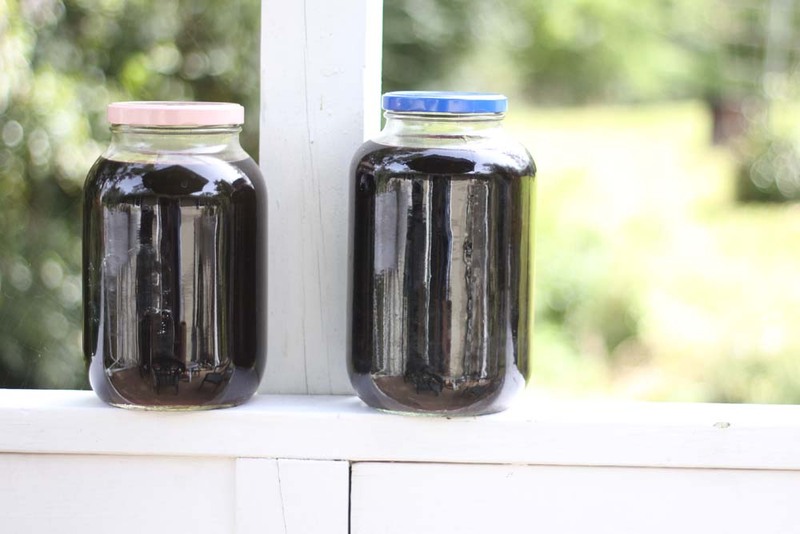 The yarn simmers in the pot or is moved to a glass jar and left to steep overnight or, in certain cases, for a day or two. It then goes through multiple rinses and soaks to help bleed out any excess dye. Finally, the yarn is left to dry fully then wound, by hand, into hanks. Since the yarn is dyed in this way, it's generally only produced seasonally. The nature of plant dyed yarns means that no two dye lots are exactly the same so be sure to purchase sufficient yarn for your project. Colors may even vary slightly from skein to skein within the same lot so you may even want to divide skeins and alternate them for a more consistent look in larger projects. Care instructions: gently wash in lukewarm water with a mild soap or wool soak. Some bleeding may occur but won’t affect the final color. Use a towel to gently press the excess water out. Do not wring or twist. Lay flat to dry, out of direct sunlight. Always store yarn out of direct sunlight. If you'd like to read certain blog posts about specific dye adventures, check here. And this post specifically, explains a lot of where I am in my fiber journey. If you ever have any questions, feel free to email me! 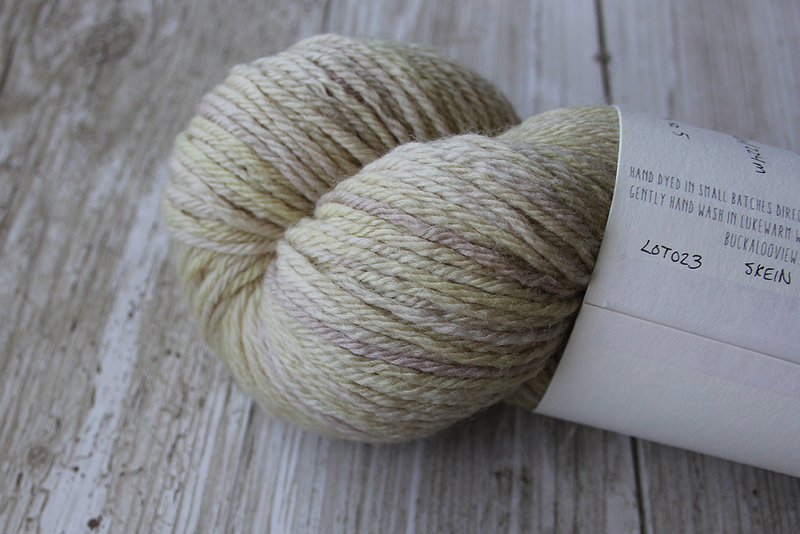 Will naturally dyed/plant dyed yarns fade? Honestly, probably. But commercially dyed yarns do, too! Hand knits aren’t usually worn and treated to extreme situations (bright UV sun, harsh elements, heavy and frequent washing.) With careful use and washing, your color should last you a very long time. Certain dyed materials naturally keep better than others, walnuts, in particular, are known for their lightfastness. I always take measures to be sure the color sticks the best it can, by prepping the yarn beforehand. In my opinion, the way yarns age with time is part of what makes natural yarns so appealing! 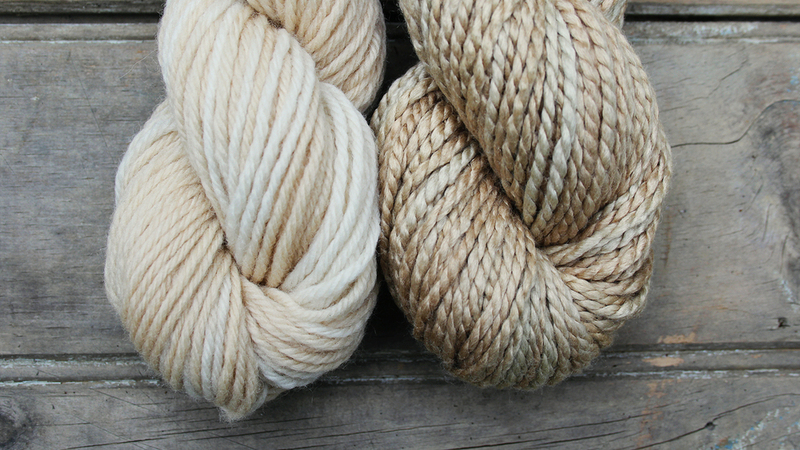 Are naturally dyed/plant dyed yarns safe? 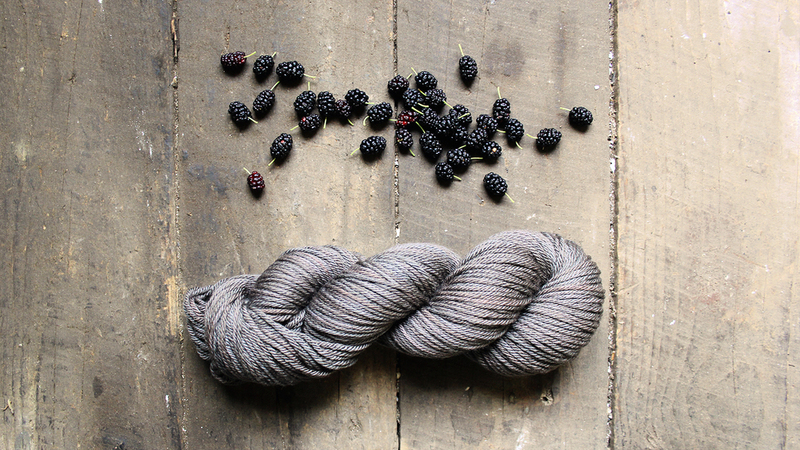 What all goes into the yarn dyeing process? I only use alum, cream of tartar, vinegar, baking soda as mordants and modifiers. I steer clear of heavy metals. I’ve had plenty of exciting dye results without them. Since I use the same pots and equipment and don’t always scrub them in between each bath (often just a rinse and wipe), I feel compelled to mention that people with any severe allergies might want to avoid my yarns. I don't think it's a real issue, but I do want to mention it. Where are the yarn bases from? I like offering a variety of yarn bases at different price points to appeal to every knitter’s budget. Some are commercially produced while others are US raised and spun, some are organic, or minimally processed, etc. If you ever have any questions about any specific yarn in the shop, please feel free to contact me! Will the color bleed when I wash it? A little bit, yes. But it shouldn’t affect the final color. It’s just excess pigment that never rinsed off. Honestly, I’ve had many commercially dyed skeins bleed. If you have any issues with any yarn you've purchased, let me know. Hand knits should always be washed gently by hand, especially if they are 100% natural fiber. I prefer a gentle pH neutral wool soak, like Eucalan. Simply follow directions on the bottle. Use a towel to blot out excess water by rolling and pressing it gently. Then lay your knitted project out flat to dry, shaping it to the size and measurements you want. Never let it dry it direct sunlight and avoid storing yarn or knitted items in direct sunlight. Of course! That is the nature of naturally dyed yarns. There will be variations, usually subtle variegation but occasionally stark ones. VM is possible, from the original spinning process or leftover from when I dyed the yarn. I don’t knot or splice my yarns together. If you come across a connection, it came that way from the original source. I wind every single skein by hand so I have a good idea what each skein consists of. 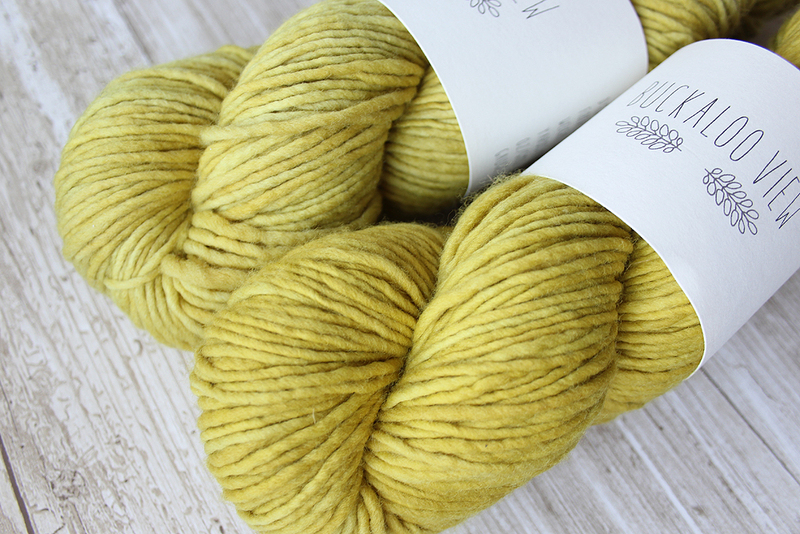 If there are a lot of imperfections or a very obvious one, the skein will be sold in the shop as a “second” at a discounted price or kept in my personal stash. Can I get enough for a large project, like a sweater? I tend to dye in very small lots, usually only two skeins. Occasionally, I do four skeins and in rare occasions I’ll do six. But, I am hoping to expand and offer larger lots in the future! As of right now, a good rule of thumb, the number of skeins you see in the photo in the listing is the number of skeins that are in that particular lot. Is the info on the label accurate? All yardages and weights are estimates. Usually, the actual skein has more than what is written on the label but there are certain cases when the skein might be a gram under. As far as the names I give bases, they are the manufacture’s suggestion of yarn size. Check the gauge info to get a better idea of how thick the yarn is. Once again, if you want any more info any specific yarn, I'm happy to help.